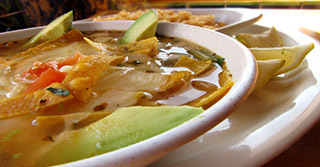 Rich chicken broth cooked with vegetables, tomatoes, onions and avocado slices. Topped with Jack cheese and tortilla strips. Served with rice. A flour tortilla filled with chicken or ground beef, beans and cheese. Topped with red sauce and Jack cheese. Served with lettuce, sour cream, pico de gallo, guacamole, rice and beans. Beef strips slow cooked in our green salsa served with rice and beans. Chunky chicken soup with vegetables and pico de gallo. Served with three tortillas with a side of rice. A flour tortilla stuffed with pork carnitas, cooked with pico de gallo. Topped with green sauce and queso dip. Served with lettuce, sour cream, pico de gallo, guacamole, rice and beans. Tender deep-fried pork tips topped with onions and jalapenos and served with rice, beans, guacamole salad and green sauce. Tortilla chimps covered with beans, grilled steak or grilled chicken with melted Monterey jack cheese. Served with lettuce, sour cream, pico de gallo and guacmole. 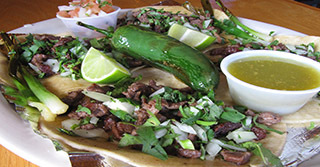 Your choice of chicken or ground beef in a crispy tortilla shell with beans and lettuce. Topped with Jack cheese, guacamole, sour cream and pico de gallo. A flour tortilla stuffed with your choice of grilled chicken or steak with beans and cheese. Topped with red sauce and served with lettuce, sour cream, pico de gallo, guacamole, rice and beans. Baby back ribs seasoned, grilled and brushed with spicy apple jelly. Served with a salad and mashed potatoes. 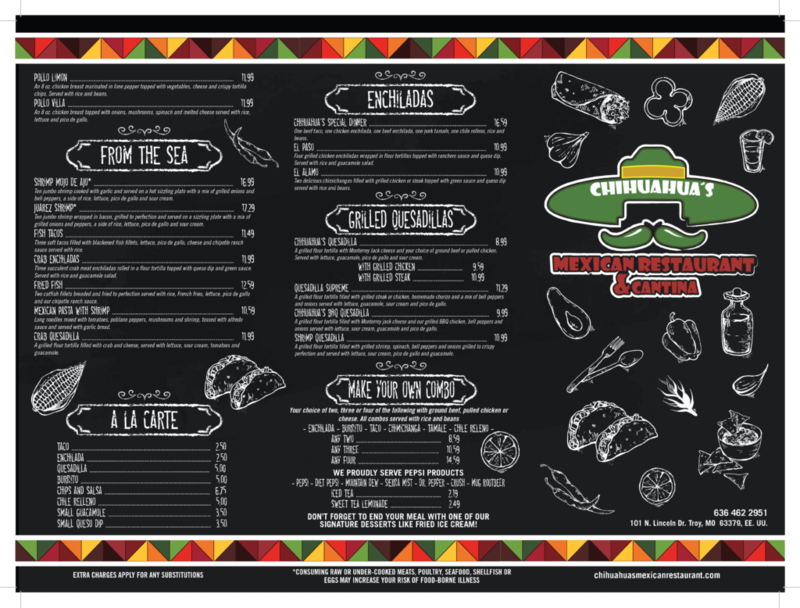 Crispy tortilla chips covered in beans, chicken or ground beef, jalapenos, pico de gallo, sour cream and queso dip. Fresh mix of lettuce and spinach served with our fat free Chihuahua vinaigrette dressing, fresh avocados, onions, tomatoes and Jack cheeses. A deep-fried burrito filled with grilled shrimp, onions, bell peppers and tomatoes. Topped with queso dip and green sauce served with a side of rice and guacamole salad. Four tacos per order. Your choice of flour of corn tortillas. Served with beans, pico de gallo, grilled green onions and green salsa. Grilled shrimp, bell peppers and onions served on top of a bed of tortilla chips covered with queso dip and Monterey jack cheese. A classic favorite. Chilled Romaine lettuce served with Caesar dressing, grilled chicken, tomatoes, sliced avocado and Jack cheese. A deep-fried burrito filled with your choice of chicken or steak and beans topped with queso dip, lettuce, sour cream, pico de gallo and guacamole served with rice and beans. Ten fried wings dipped in your choice of hot sauce or sweet BBQ sauce and served with a side of ranch. A deep-fried burrito stuffed with ground beef or chicken topped with queso dip and served with lettuce, pico de gallo, guacamole, sour cream, rice and beans. MOLE CHIHUAHUA STYLE … 9.99A traditional Mexican dish made with pulled chicken mixed with mole sauce. Served with rice and beans. A sampler for everyone! Grilled chicken quesadilla, steak nachos, chicken wings and beef taquitos served with lettuce, guacamole, pico de gallo and sour cream. Flour tortillas rolled up with chicken or ground beef, dipped in the fryer and topped with queso dip and served with lettuce, guacamole, sour cream and pico de gallo. 10 oz. ribeye grilled and served on a hot sizzle plate with a side of green onions, jalapenos, mushrooms and avocado slices. Served with rice, beans, lettuce, pico de gallo, sour cream and cheese. Grilled chicken, steak fajitas, bacon wrapped shrimp, smoked pork chop, ribs and grilled veggies served on a sizzling comal with a side of rice, beans lettuce, sour cream, pico de gallo and cheese. A mix of grilled fajita chicken, steak, shrimp and chorizo served on a hot comal plate with a side of rice, beans, lettuce, sour cream, pico de gallo and cheese. Perfectly seasoned fajitas with grilled onions, green bell peppers, and tomatoes with a side of rice, beans, lettuce, sour cream, pico de gallo and cheese. 10 oz. ribeye grilled and topped with our green sauce and cheese. Served on a hot sizzling plate with a side of rice, beans, lettuce, sour cream, cheese and pico de gallo. 10 oz. ribeye grilled and served on a bed of grilled onions, tomatoes and bell peppers served on a hot sizzling plate. Topped with ranchero sauce and pico de gallo served with lettuce, sour cream, cheese, pico de gallo, rice and beans. 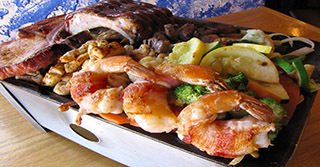 A perfect combination of five jumbo shrimp wrapped in bacon and a half rack of ribs on a sizzling plate with onions, peppers and tomatoes. Served with rice, beans, lettuce, pico de gallo, cheese and sour cream. An 8 oz. grilled chicken breast topped with onions, tomatoes and jalapenos, served with rice and beans. A combination of grilled fajita chicken and baby back ribs presented on a sizzling plate with onions, peppers and tomatoes. Served with a side of rice, beans, lettuce, pico de gallo, cheese and sour cream. 10 oz. ribeye grilled with jalapenos, onions and tomatoes topped with cilantro and queso dip. Served on a sizzling plate with a side of rice, beans, lettuce, sour cream, cheese and pico de gallo. 10 oz. grilled ribeye topped with chorizo and cheese on a sizzling hot plate served with a side of rice, beans, lettuce, sour cream, guacamole and pico de gallo. A mix of grilled fajita chicken and bacon-wrapped shrimp served on a sizzling plate with a side of rice, beans, lettuce, pico de gallo, cheese and sour cream. An 8 oz. chicken breast marinated in lime pepper topped with vegetables, cheese and crispy tortilla chips. Served with rice and beans. An 8 oz. chicken breast topped with onions, mushrooms, spinach and melted cheese served with rice, lettuce and pico de gallo. Ten jumbo shrimp cooked with garlic and served on a hot sizzling plate with a mix of grilled onions and bell peppers, a side of rice, lettuce, pico de gallo and sour cream. One beef taco, one chicken enchilada, one beef enchilada, one pork tamale, one chile relleno, rice and beans. A grilled flour tortilla with Monterrey Jack cheese and your choice of ground beef or pulled chicken. Served with lettuce, guacamole, pico de gallo and sour cream. Ten jumbo shrimp wrapped in bacon, grilled to perfection and served on a sizzling plate with a mix of grilled onions and peppers, a side of rice, lettuce, pico de gallo and sour cream. Four grilled chicken enchiladas wrapped in flour tortillas topped with ranchero sauce and queso dip. Served with rice and guacamole salad. A grilled flour tortilla filled with grilled steak or chicken, homemade chorizo and a mix of bell peppers and onions served with lettuce, guacamole, sour cream and pico de gallo. Three soft tacos filled with blackened fish fillets, lettuce, pico de gallo, cheese and chipotle ranch sauce served with rice. Two delicious chimichangas filled with grilled chicken or steak topped with green sauce and queso dip served with rice and beans. A grilled flour tortilla filled with Monterrey jack cheese and our grilled BBQ chicken, bell peppers and onions served with lettuce, sour cream, guacamole and pico de gallo. Three succulent crab meat enchiladas rolled in a flour tortilla topped with queso dip and green sauce. Served with rice and guacamole salad. A grilled flour tortilla filled with grilled shrimp, spinach, bell peppers and onions grilled to crispy perfection and served with lettuce, sour cream, pico de gallo and guacamole. Two catfish fillets breaded and fried to perfection served with rice, French fries, lettuce, pico de gallo and our chipotle ranch sauce. Long noodles mixed with tomatoes, poblano peppers, mushrooms and shrimp, tossed with alfredo sauce and served with garlic bread. A grilled flour tortilla filled with crab and cheese, served with lettuce, sour cream, tomatoes and guacamole. 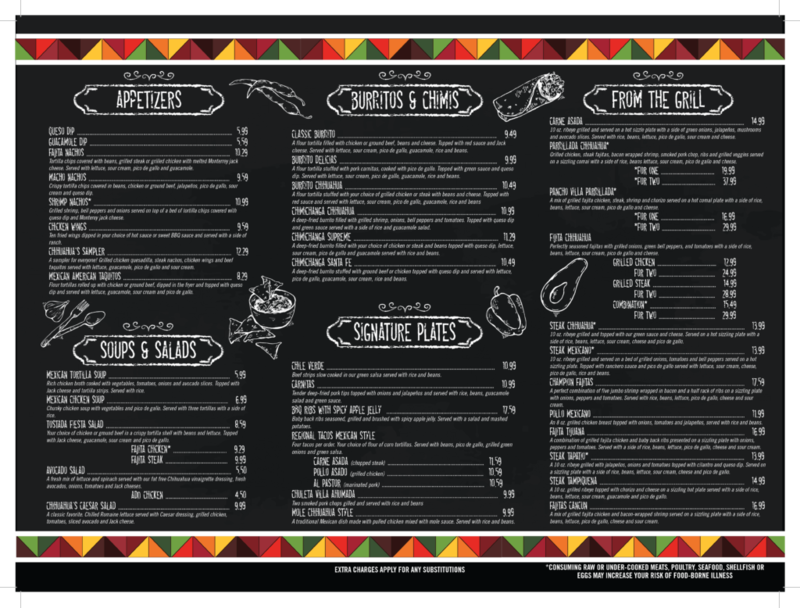 Enjoy our best fajitas in the perfect lunch portion for the perfect lunch price! All fajitas served with rice, beans, pico de gallo, sour cream, jack cheese and tortillas. A flour tortilla stuffed with grilled chicken or steak, onions, bell peppers, beans and red sauce. Served with rice and beans. A deep fried flour tortilla filled with beef or chicken, smothered with queso dip and served with rice and beans. Filled with steak, chicken, bell peppers, onion and tomatoes, lettuce and cheese. Filled with grilled BBQ chicken, lettuce, fries, pico de gallo and guacamole and served with rice. Mixed greens, red onion, black been relish and grilled chicken. CHOICE OF RICE, BEANS, CUP OF SOUP OR HOUSE SALAD.